Key West Florida is located in the Florida Keys at the southernmost point in the continental United States. Surrounded by the Caribbean Sea, the temperatures register in the 80s and 90s year round. WOW! 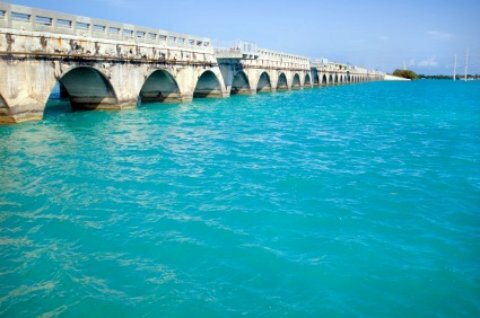 Long bridge to Key West but the views (WOW) are worth the ride! It's always a good beach day and every kind of water sport can be enjoyed here. Divers love the area, snorkelers revel in the coral and colorful fishes and of course, the water for swimming or rafting is perfect. If you are a shopper, you will love the unique shops and boutiques. There are many interesting places to grab a bite to eat and drink and watch people as they stroll by. The charm here is endless and its not hard to see why so many people visit Key West to become inspired. It's almost impossible for the infectious charm and laid-back atmosphere not to rub off on you! Ernest Hemingway chose this gorgeous city in the Florida Keys to be his home and ever since then, artists and artisans have flocked here hoping to find the kind of inspiration that served Hemingway so well as he was writing his literary masterpieces. Take a tram ride or walk around the city and you will get a first hand look at an incredible city. The guide will point out Hemingway’s hideaways and you can tour his home and gardens. Key West Florida has many different beaches to choose from ranging from popular teen beaches to beaches that are frequented by people from many different lifestyles and walks of life. When you see a small tree laden with tiny green fruit about a third of the size of a lime, you are seeing a Key Lime Tree. A trip to Key West Florida REQUIRES you to have a slice of the famous key lime pie and / or purchase some key lime juice to bring a little piece of this heaven back home to create your own “Key West” Key Lime Pie! A visit to Key West Florida would not be complete without a visit to the Ernest Hemingway Home and Museum where you can see where this Nobel Prize winning author spent his days, creating his legendary literary work. Enjoy a casual stroll through the Hemingway beautiful grounds and gardens and make friends with one of the 60 plus cats that live here. Yes, you heard it right- the cats love it here and you will too. Some of these cats are ‘Hemingway Cats’ that earned that distinction only by being born with larger than normal paws and more than 18 toes (in total). For more historical fun, visit East Martello Gallery and Museum, one of the city’s two Civil War lookout posts where you can spend time learning about local history and walk to the top of a beautiful spiral staircase to enjoy an incredible view. The thrifty shopper’s dream, Duval Street is full of quaint beach shops and boutiques. For souvenirs and treats for yourself, you are sure to find hours of shopping and bargains while enjoying great views of the city’s popular “conch houses”. The conch (pronounced ‘conk’) houses are beautifully restored 19th century homes rented to the wealthy who like to vacation in this beautiful tropical paradise. Travel by ferry or air to the secluded Dry Tortugas National Park where you can visit Fort Jefferson, a former fortress and home to Civil War military and prisoners of war… sounds kind of intimidating, but when you see it, you’ll see why it’s such a popular Key West activity. This national park is simply gorgeous and like it’s own little world… away from the rest of the world, where you can enjoy various water and beach activities to your heart’s content. The Key West Aquarium is a favorite of kids and adults alike, offering great “fish feeding” shows and unique marine life observation, such as squirrel and porcupine fish. Eating: Just say mmmm while you feast on delicious Caribbean and seafood cuisines at Blue Heaven. Try Conch Republic Seafood Company to enjoy more heavenly seafood while experiencing an incredible view of the Key West Historic Seaport. Sleeping: The hotels in the area can be pricey because they are located on one of the most beautiful beaches you’ll ever see in one of the most unique areas you will ever see. To get more bang for your buck, a stay in the Best Western Hibiscus Motel provides a little bit less expensive option but doesn’t skimp on service or beauty- a great pool area is an added bonus. If you do want to go all out, Banyan Resort offers condominium suites that have full kitchens and living rooms and will truly feel like home… or better than home. Be careful or you will get attached to the laid-back lifestyle and never want to leave Key West Florida!